Heat oven to 425°F. Make pie crust as directed on box for One-Crust Filled Pie using 9-inch glass pie plate. Bake 7 minutes. Remove crust from oven; sprinkle blueberries over bottom of crust. In large bowl, beat all remaining ingredients with electric mixer on medium speed 1 to 2 minutes or until smooth. Pour over blueberries. Return to oven; bake 10 minutes. Reduce oven temperature to 350°F; cover edges of crust with foil. Bake 30 to 32 minutes or until knife inserted in center comes out clean. Let stand 20 minutes. Serve warm or cool. Store in refrigerator. 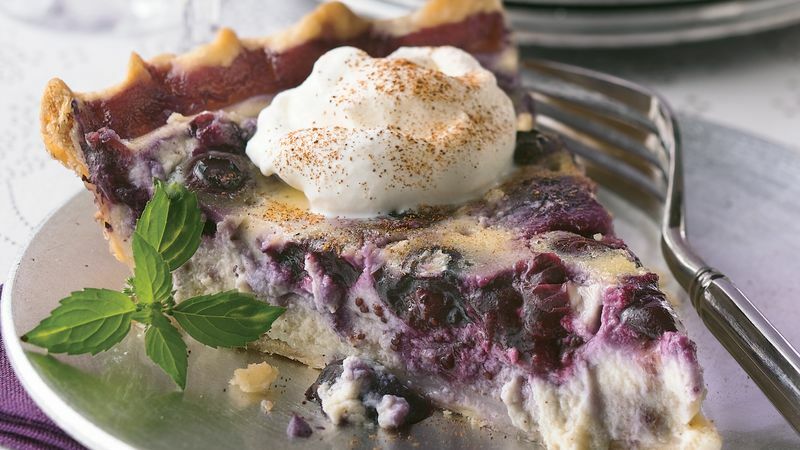 This recipe was inspired by a Finnish favorite made with yogurt and blueberries called Mustikka Piirakka. The Finnish people eat the pie warm or cool. Serve slices of this heavenly pie topped with whipped cream and a sprinkle of cinnamon.